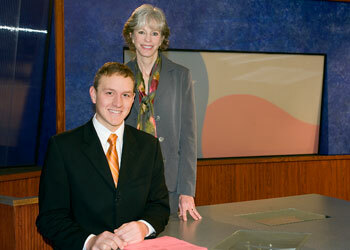 Cory Lazar, with mass communication adjunct faculty member Jocelyn Lane, was recognized as "Best Anchor" for his work on SHSU's student-run Channel 7 News. Corey Lazar, a junior at Sam Houston State University, was recently awarded “Best Anchor” by the Broadcast Educators of America. The TV news category award was presented to Lazar in Las Vegas during an awards ceremony on April 15-17. To compete, students had to submit a one-minute demo reel to be judged by the Broadcast Education Association. Lazar is a mass communication major with an emphasis in broadcast journalism and a minor in political science. Among his many accomplishments, he has been a news anchor on Channel 7 for two and a half years. During that time he has developed his own style and learned to be comfortable on camera. “I have come to understand what matters to those who are watching the news,” Lazar said. “It’s important to speak in a conversational manner. According to Lazar, his involvement in the mass communication department at SHSU has helped him grow and develop the skills that resulted in the BEA award. “The department has the best professors and staff,” Lazar said. “The professors have been in the field for a long time and know their information. They are all willing to help in any way possible. Lazar remembers having hands-on experience with the camera very early into his freshman year. He feels that working hard and his involvement in the department have benefited his college experience greatly. After he graduates, Lazar desires to be a news reporter for local TV news stations and eventually become a news anchor in Houston or Dallas.